In keeping with the theme of 'reflecting on the Druces journey' and the combination of retrospective and future-gazing elements of our 250th anniversary, initial research centred on the ancient coat of arms and family crest for the 'Druce' name. Elements of these originals helped to shape our vision for the 250 logo. A core part of ‘making the most of’ our firm’s 250th anniversary is acknowledging that this is a milestone worth noting and celebrating. Our bespoke 250 logo is the prime method of visually portraying this sense of celebration and of 2017 being a special milestone year. For those that we engage with - including clients, potential clients and industry peers - the first exposure to the firm comes through the logo. As the prime brand identifier, this must be a strong visual which calls to mind brand values as well as incorporating the celebratory element of a big anniversary. This visual first impression must be representative of the firm’s services and core values, of who the firm is and what the firm does. It must, therefore, be strong and impactful but in the simplest format possible. For these reasons, we bring you an explanation of how the Druces 250 logo has evolved from concept to reality. The Druces brand carries significant weight based on the firm’s storied history and commitment to core values covering ambition, adaptability, heritage, individuality, integrity and personality. This must be maintained throughout the 250th year; while this anniversary year is a cause for celebration and an opportune moment for reflecting on past successes and refocusing brand objectives, it is important that we do not lose sight of the core Druces principles. With this in mind, and in firm keeping with the Druces values outlined, the 250th logo is a working adaptation of the existing Druces logo, and incorporates the Druce family crest on the shield that overlays the ‘U’ of ‘Druces’ in a manner that tallies with our emphasis on adaptation, heritage and individuality. The positioning of the 250 stamp above the ‘U’ shield ensures that due prominence is devoted to the sestercentennial celebrations, while the dates 1767 and 2017 bookend ‘London’ beneath the main body of the ‘Druces’ logo, providing a visual timeline that contextualises the brand’s journey and evolution in the city from 1767 through to the present day. Composition along the horizontal axis is in keeping with the firm’s original logo and retains a L – R read. The U shield modification allows us to introduce a stylistic graphic component to the logo while maintaining the unique, asymmetrical rhythm of the visual brand and retaining the classicism and elegance it represents. Situating London as the terminus for T – B reading graphically underscores the strength of the Druces logotype and features the sestercentennial dates on L – R reading along the same baseline. The effect of London intersecting these dates presents the notion of a timeline of perpetuity. This ties in with the key messaging around our 250th birthday – looking back on the Druces journey and looking ahead to see how the firm continues to evolve and attract business. Again, this is complementary to the microsite and dedicated Druces 250 timeline. 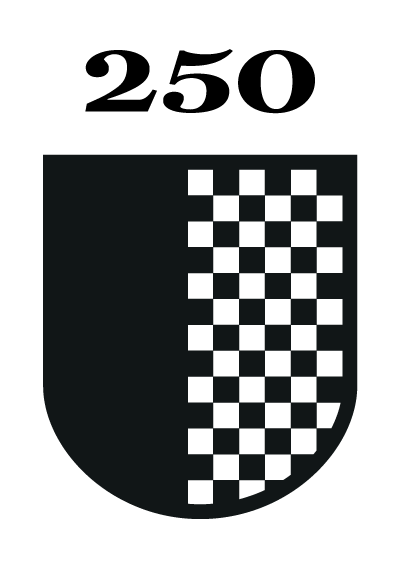 The chessboard element of the Druce family shield is also carried across, helping to emphasise the firm’s traditions and conjure the emotions brought to mind by the Druces brand, including: intellectual thinking and innovative problem-solving, understanding of complex legal issues on a granular basis as well as a market-leading ability to conduct high level overviews and comprehensive project management, excellent technical expertise and capability, and commitment to delivering first rate client service. The 250 logo typeface is called 'Miller'. Miller is a transitional serif typeface family released in 1997 by the Font Bureau - a US-based digital foundry. Designed by Matthew Carter, it is considered a 'Scotch Roman' design - a style that originated from Scottish foundries in the early 19th century. Miller is also recognisable because it is commonly used by various US newspaper publishers. The finished product combines the elements outlined above. The result is an eye-catching combination of elegance and classical minimalism which harnesses the existing brand power and gravitas associated with Druces, while also emphasising our special anniversary year.